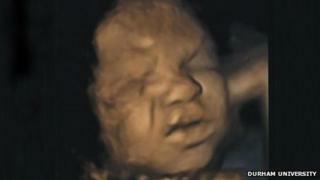 Unborn babies "practise" facial expressions of pain, researchers from Durham and Lancaster universities say. They believe the foetus is "learning" how to communicate after birth, through crying or grimacing in the womb. A study of ultrasound scans suggests movements develop during pregnancy, from simple smiling to more complex eyebrow lowering and nose wrinkling. Lead researcher Dr Nadja Reissland said understanding "normal development" could help doctors identify problems. "It is not yet clear whether foetuses can actually feel pain, nor do we know whether facial expressions relate to how they feel," she said. The research indicated facial movements were linked to brain maturity rather than actual feelings, she added. 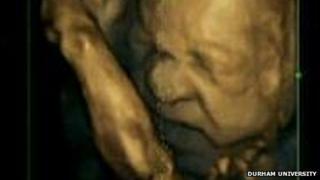 The study looked at video footage of 4D scans of eight female and seven male foetuses. It follows previous research suggesting facial expressions of healthy foetuses develop and become more complex during pregnancy. Dr Reissland, a senior lecturer at Durham University, said: "It is vital for infants to be able to show pain as soon as they are born so that they can communicate any distress or pain they might feel to their carers."